A Week in the Summer Life of a Sewing Blogger! You know that part of Summer when you are past the lull of the slower pace ( that never really happened here) and then you are hit with a flurry of places to go, things to do and visitors ( that is totally happening now)? This past week has been filled with awesomeness that I have not even had a chance to stop and share! One of my dearest friends had a wedding last weekend ( YAY!). Katy and I drove up to Ohio on Friday for the wedding on Saturday and drove home Sunday! Craziness! There were many Barn Quilts on the way there and back. I was only able to get shots of a couple since we did not have much time to lollygag along the way. This one is really pretty! Both of these were found in Ohio. I need to add making a barn quilt for my house to my list of things to do! 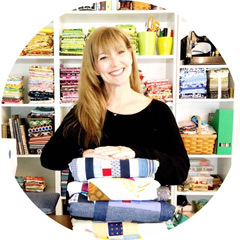 While we were in Ohio, we visited Jesy Anderson in her shop Sew Dayton. We were there for the last Sip N Sew since the shop will be closing soon. Jesy and her partner Tracy will be both opening shops again soon so Dayton will have DOUBLE the sewing fun! Be sure to visit their shop for some amazing closing deals! Jesy's new shop is Needle Ink and Thread and will be sewing classes! I am hoping to be able to snag some teaching gigs! So keep your eyes peeled for me returning to Ohio soon! If you have not had the great pleasure to meet Jesy, you will LOVE HER! She is fun and funny! There may have been some singing and theatrics going on while I was there. You never know with me. The first time Jesy and I met, I was wearing a HOT PINK crinoline on my head. Life is too short...I like to enjoy my every moment! Art Gallery Fabrics designer Sharon Holland was too sweet and also drove into Dayton to see the shop and me ( BIG HEARTS)! I was able to feel Art Gallery knits for the first time and, I have to say, they are FABULOUS! I am looking forward to taking the big plunge into some garment sewing with Art Gallery knits! I am keeping my fingers crossed that Sharon will be teaching at Jesy's shop too! She is brilliant and I know I could learn so much from her! I did not get a photo with Sharon so I snagged a photo of her beautiful fabrics from her site ;o) The dandelions in a knit...Oh MY! And in the past week I have sewn very little. Driving, visiting, wedding, the teenager had a birthday so we also went shopping and when we returned home, both the 25 year old and the nine year old are ill and the icing on the cake...my mother in law is coming for a week...arriving today! It all happens at once...always! I do not let life get in my way so I did take the time to figure out how to sew a log cabin circle. This has been on my dream list forever! The fabrics are thrifted shirts from the Goodwill and I pieced this block with Aurifil 50wt thread. Last week, prior to leaving, I also made these adorable Economy Blocks! This was my crazy week, how about you? How do you manage your many schedules when you have a avalanche of activity take over? OH MY GOODNESS!!! 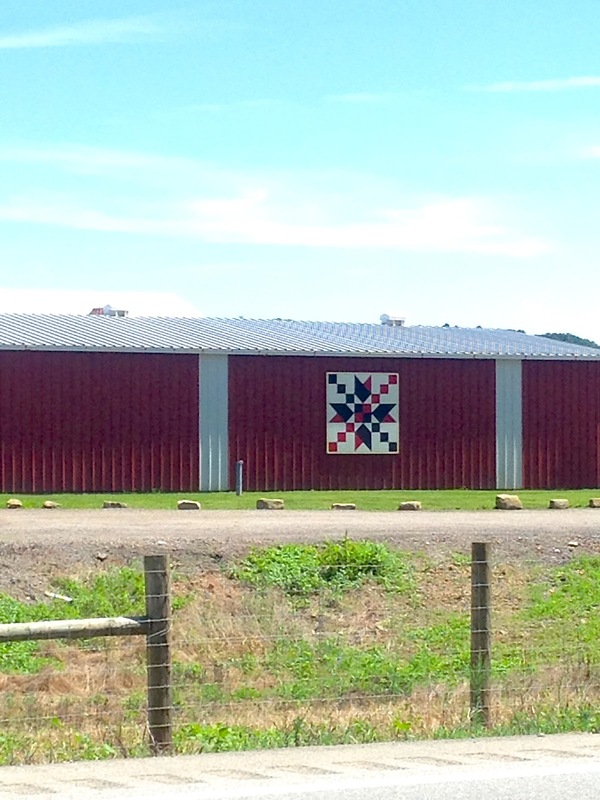 Are those barn quilts close to the OH/WV border? Pretty sure I just saw those a couple of weeks ago on our trip to NC. I have almost the same shot on my phone of the white barn. We played count the barn quilts on the drive. Drove my husband crazy. I live about 5 minutes from Sew Dayton. Lalaluu should know that Sew Dayton is not a quilt shop per se, more of a sewing shop. It's a fun and welcoming space, and I expect the two new shops will be similar. If anyone traveling to Dayton is looking for a good quilt shop, she should make time to visit The Fabric Shack in Waynesville (about 30 minutes away). The store is amazing and they have so much more available on their website. Did you know that every county in Ohio (88 total if I am remembering correctly from 5th grade history) has a Bicentennial Barn? They are fun to look for while searching out the barn quilts.